A bit of trivia about Château de Pellehaut is that they used to produce entirely from ugni blanc grapes until 1996, but turned entirely to folle-blanche in 1997. This particular armagnac represents the brief transitional period while they were using both, but keeping the wines and distillates separate. This brandy was distilled in 1996 from folle-blanche grapes, filled into new oak casks, then bottled in 2013 at 50.4% without coloring or chill filtration for K&L Wines. Thanks to Florin for this sample. Taste: big oak and grape sweetness up front, a syrupy thickness around the middle, becomes more bitter/bittersweet with big oak and some creaminess towards the back. After dilution the sweetness is stronger up front, the oak turns into cedar in the middle, and the bitter turn at the back is more aggressive. This was kind of disappointing. I had read a lot of really positive reviews as this release helped cement Pellehaut's reputation in the U.S. Might just be that I sat on the sample for too long, but water at least got it closer to those expectations. For a more favorable perspective, see MAO's review from the same bottle. Château de Pellehaut seems to be one of the more well-known armagnac houses, at least in the States. Located in the Ténarèze region in the middle of Armagnac, it follows the traditional practice of distilling their wines in a mobile still. The output is at a rather mild 54%, which helps to explain both their robust flavors and the often low-ish strength of their single casks. They fill all of their fresh spirit into 420 liter new oak casks. This particular cask was distilled from wine made entire from folle-blanche grape in 2001, filled into a new oak cask, then bottled in 2016 at 48.6% without coloring or chill filtration for K&L Wines. Nose: rich berry and juicy grape, wild honey, moderate but not overbearing oak, a little cedar, vanilla, citrus peel, baking spices, peanut brittle, a thread of wood smoke/incense. After adding a few drops of water it gets flatter and loses most of its intensity except for the oak, with the fruitier brandy notes becoming grain. Taste: lots of grape, berry, and honey sweetness starting up front and continuing through, orange peel in the background, some heat and a savory note in the middle, fading into moderate oak and grape tannins. After dilution almost all of the heat disappears, the oak becomes less tannic, and some raisin (rather than grape) notes come out around the back, but the overall structure remains about the same. As Bozzy noted, this is very much a bourbon, and even more specifically a wheated bourbon, drinker's armagnac. It doesn't have the spiciness that you would expect from rye bourbons, but the balance of sweetness, fruit, and oak are basically spot-on. I was a little disappointed by how much the aromas faded with water, but if you leave it alone they're all good. At the $50 it went for retail, I think this pretty handily beats most comparably priced bourbons as long as your expectations are set for brandy rather than whiskey. It's not the most complex thing, but it definitely hits all the right notes. Isle of Skye is a product of Ian Macleod, an independent bottler and the owner of both Glengoyne and Tamdhu distilleries. The brand was pretty low-key for decades with old school, rather plain labels on their bottles and prices to match. They relaunched the lineup a few years ago with new labels and older limited editions. Unfortunately that also means that the price has gone up locally, but I've still been itching to try the older version. This blend is constructed from grain whisky plus Speyside and Island (of course strongly hinted to be Talisker from the name) malts that are married together in casks before bottling at 40%, almost certainly with chill filtration and possibly a little coloring. Nose: rather light - sherry, hints of savory peat, mixed nuts, raisins, vanilla. After adding a few drops of water the sherry gets stronger, there is more peat and oak, plus some baking spices come out. Taste: balanced malt/grain up front, sherry throughout, a little chocolate and oak in the middle, not a lot of development. After dilution it becomes a little brighter, but with less heat, more noticeable peat at the back, and more vanilla. Well, that was kind of disappointing. I really enjoyed the 8 Year, which was far more bold. This is smoother, but just doesn't offer anything particularly interesting. I would buy it over a lot of standard 12 year old blends as the peat adds a little something, but it's just not engaging enough to make me want to drink it on the regular. I'd give this a miss in favor of the younger, cheaper version. While I was in Washington D.C. in early November, I dropped by Black Whiskey for dinner and a couple of drinks. Glancing at their back bar I noticed a decent collection of blends that I decided to try. I've had a few releases from their Great King Street lineup. The Artist's Blend was perfectly decent, but somewhat uninspiring. The one-off New York Blend was far better and a peat-y treat. So I was very interested when the Glasgow Blend was released, which looked to combine the peat of the NY Blend was sherry cask whisky. Unfortunately it is rather expensive locally, so I haven't been able to bring myself to buy it. The whisky is composed of a mix of 35% grain whisky from Cameronbridge and 65% malt whiskies from a number of distilleries and cask types, the details of which can be found on Compass Box's site. It is bottled at 43% without coloring or chill filtration. Nose: strong but not overwhelming Laphroaig smoke, solid underpinning of malt and grain, backdrop of sherry, Speyside floral notes in the background. After adding a few drops of water it becomes a little washed out leaving peat smoke on a smoothly grainy bed, less sherry. Taste: opens with balanced malt/grain/sherry sweetness, joined by moderate but not tannic oak and caramel in the middle, sherry in the background throughout, rising but not overwhelming peat smoke at the back. After dilution it becomes smoother but maybe too much, a little washed out but more sherry. This is a good whisky, no doubt about it. It's a well-composed blend that uses its grain component as a base while letting the malts do most of the work. I think I missed a bit because I was served this whisky in a tumbler, but the general sense was still very positive. If I can ever find this for under $40 with shipping I will definitely be grabbing a full bottle. For most of the 2000s Ardbeg had a static standard lineup composed of the 10 Year, Uigeadail, and Corryvreckan. With their near neighbor Laphroaig throwing off new NAS releases with unusual rapidity, Ardbeg seemed almost staid in comparison with the only variation coming from their annual one-offs. But more recently it seems that they've been paying attention to Laphroaig's strategy, most notably with their Select release that took something of a kitchen sink approach and prominently featured new American oak casks in the mix. Ardbeg decided to copy that strategy with An Oa, which is composed from first-fill ex-bourbon, PX sherry, and new American oak casks that are blended together in a French oak vat. The final result is bottled at 46.6% without coloring or chill filtration. Nose: young-ish Ardbeg peat, balanced herbal and smoky, a little charcoal, clean malt and a whiff of sweet sherry in the background, some new American oak, vanilla. After adding a few drops of water it becomes softer and the sherry notes integrate with the peat and the oak becomes more savory. Taste: strong bourbon cask and malt sweetness up front, new American oak in the middle and a touch of sherry in the background, slowly fading into drier oak at the back. After dilution the sweetness and oak become more balanced, but the peat at the back is significantly reduced. This is pretty OK. The grab bag approach has its downsides, especially in the new oak influence, but this is a decent addition to their standard lineup. If you're looking for a sherry-influenced Ardbeg this doesn't provide anywhere near the experience of Uigeadail, but it's also a lot cheaper. I can also see this appealing to fans of Laphroaig Quarter Cask as the oak-driven character has some similarities. In the places where An Oa is at an equal price to the 10 Year, I think it would be a bit of a toss-up between the two depending on your taste, but around here where it's $12 more, the less fancy pick is the right one. Until the release of An Oa, Corryvrecken was the most recent addition to Ardbeg's core lineup of primarily NAS releases. It nominally replaced the vintage dated Airigh Nam Beist and was built on the model of Uigeadail, with a core of younger bourbon cask malt inflected with a speciality cask, in this case French oak rather than sherry. This whisky is aged in a combination of American and French oak casks for an indeterminate amount of time, then bottled at 57.1% without coloring or chill filtration. Nose: dry Ardbeg smoke, fresh malt, vanilla, thick American oak, fresh cedar, background French oak, a little floral. After adding a splash of water it becomes softer with more balanced peat and oak, plus a little tar and berries. 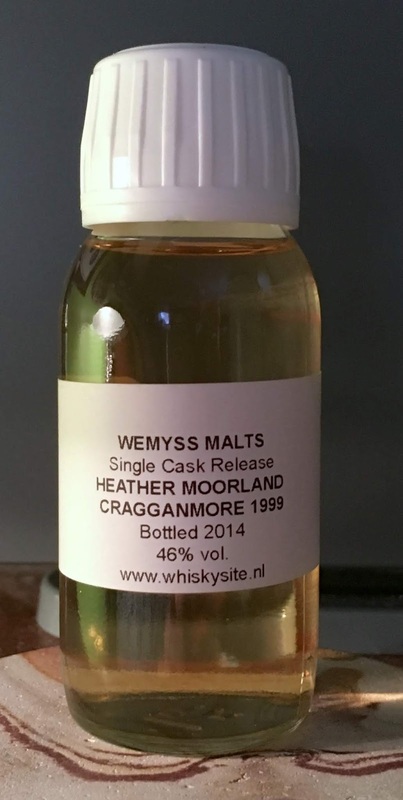 Taste: moderate malt and cask sweetness up front, quickly trumped by a thick layer of oak tannins with a raisin-y quality and sharp smoke in the background. After dilution it becomes much sweeter, with the oak and peat pushed towards the background, joined by berry overtones in the middle. This reads like the Ardbeg take on Laphroaig Quarter Cask. There's smoke and oak and not much else. Quite a contrast to the more complex French oak cask that I tried at the distillery, this is mostly young American oak with the fresh lumber quality that I have found in so many other younger Islay whiskies lately. Proofed down a bit it reads fairly similarly to the standard Ardbeg 10 Year, albeit with more oak. That's not to say this is bad, but I don't see that it's worth the premium over Uigeadail. If I'm going to pay this kind of money for a young product it will be to support smaller players like Kilchoman. Nose: strong but not overwhelming mossy/smokey Ardbeg peat, smoked fish in the background, creamy malt, lots of vanilla getting floral around the edges, American oak verging into sherry, berries. After adding a few drops of water the smoke and oak integrate and soften, edging out the other aromas. Taste: lots of oak-y sweetness up front, berries and dried fruit appear in the middle with dried chilies without a lot of heat in the background, a very creamy mouthfeel without a lot of malt flavor, becoming more tannic and joined by dry Ardbeg peat at the back with fairly strong heat. After dilution it becomes softer and sweeter up front, but the oak tannins at the back are amplified and it loses much of its complexity. While there are some differences, this is fairly consistent with the L13 bottle I tried above, though the flavors are more dynamic and nuanced here. Much like the L18 Uigeadial, the nose is better than the palate, but they're a little closer to being in balance. There is significant oak influence, but it continues to read primarily as American rather than French oak. Overall I could see myself drinking more, but this doesn't change my feeling that its quality doesn't justify its cost. Unfortunately as long as enough consumers disagree, I don't think we'll see any change. Uigeadail has been one of Ardbeg's mainstays since it was introduced in 2003. Combining bourbon cask whisky with sherry casks whisky, it sought to incorporate the two characters without losing the distillery's trademark peat smoke. While the initial batches were produced using sherry casks from the 70s, these inevitably ran low and were allocated for more expensive releases. 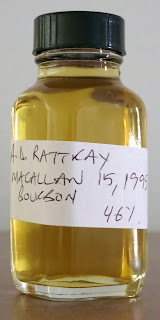 Since then it has become increasingly clear that most or all of the spirit going into the mix is relatively young - when I went to the Deconstructing the Dram tasting at the distillery in 2013 we were giving a sample from a six year old sherry cask as a representative component. This has raised questions about the quality and value of the expression now compared to when it was first released. Since I first tried Uigeadail from a miniature I've thought it is as relatively simple but still fairly good. So I wanted to give it another go to see where it stands today. As with all Uigeadail, the whisky is aged in a mix of ex-bourbon and ex-sherry casks, then bottled at 54.2% without coloring or chill filtration. Nose: a little thin, moderate Ardbeg peat, background oak, a layer sherry, vanilla, cacao nibs, a touch of something floral. After adding a splash of water it becomes softer and flatter with more bourbon than sherry cask character. Taste: rather hot throughout - malt and sherry sweetness up front, mild peat, vanilla, and oak near the back, a little flat. After dilution it becomes noticeably sweeter up front, but flatter and less overtly peated at the back. Wow, what a letdown. Compared to the miniature I tried in 2013, this comes off as thin and hot, without the depth of flavor I found before. There are some nice touches in the aromas, but they were difficult to find behind all of the hot alcohol. It feels like a bad batch made when they were running low on quality casks, whether sherry or bourbon. There's just not much going on here, definitely nothing that would make me want a whole bottle. Just to check if this was simply a bad sample, I also had a pour from a freshly opened bottle at the Highland Stillhouse. So hopefully this is more representative of what you'd be getting at the moment. Nose: thick sherry, a respectable level of smoky Ardbeg peat, cured meat, juicy raisins and berries, vanilla, herbal, cinnamon, roasted malt. After adding a few drops of water the sherry retreats to reveal more peat and it becomes saltier. Taste: thick, sweet sherry throughout, hot but not overwhelmingly so, peat doesn't really come in until the finish. After dilution the malt shows up behind the sherry and the peat comes in earlier. Well, this is quite a bit more like it. While the flavors were a bit of a letdown, the nose had pretty much everything I would have expected at this point. Hits all of the sherry cask and Ardbeg notes with solid intensity. With that said, I still can't see myself paying more for this than for any other NAS sherry monster. There's just not enough complexity to justify a higher price point. While Bunnahabhain has primarily been known for its unpeated spirit, following a successful experiment with peated malt in 1997 the distillery has been regularly producing peated spirit for a few weeks each year since 2003. This peated malt whisky has generally been known as Mòine, occasionally appearing on independently bottled releases over the last ten years or so. More recently the distillery started releasing its own whisky under that name, without any age statement. This whisky was aged in ex-bourbon casks, then bottled at 46.3% without coloring or chill filtration. Nose: lots of young, dry, spicy peat, a little sour (yogurt? ), overripe oranges, green malt, seaweed, very light oak, a little vanilla. After adding a few drops of water it peat becomes softer, but it remains largely unchanged. Taste: strong malty sweetness up front, fairly hot throughout, berry overtones starting around the middle, moderate oak and young peat at the back. After dilution it remains more or less the same, but with less heat and a thicker body. This is... OK? There's nothing particularly wrong if you enjoy younger heavily peated single malts, but by the same token there's nothing about it that stands out compared to other entrants in the field. It makes me want to try Ceobanach, which is nominally the same spirit aged for at least ten years, which would hopefully push it closer to its stablemate Ledaig 10 Year. Bunnahabhain is one of the Islay distilleries that used to have an extremely compact product line, much like Laphroaig. There was a 12 Year, an 18 Year, a 25 Year, and the occasional special release at a higher age. More recently they have been radically filling out the price spectrum, largely with NAS malts. Perhaps sensing that they needed something to bring in new customers who weren't willing to splash out for their more standard 12 Year, Stiùireadair comes in at a more manageable 30-odd euros. This whisky was aged in first-fill sherry casks, then bottled at 46.3% without coloring or chill filtration. Taste: sweet sherry with a fair amount of heat up front, clean malt in the background, becomes more bittersweet with a little oak towards the back, but remains uncomplicated. After dilution the structure remains more or less the same but with less heat, brighter sherry up front, and more sherry bitterness at the back. If this is meant to be competition for the OB 12 Year, it fails. It might be more overtly sherried, but it doesn't have the intensity or complexity to stand up. As an entry-level malt it may be more successful, but I'm still not sure it's a particularly compelling experience, even at that price point. Maybe if this was released at 50% or batch strength it would have a bit more to offer, but as is I would give it a pass. Giboin is a small cognac house with vines located in the Fins Bois and Bordaries regions. It has been family owned since 1830 and produces no more than 4000 cases a year. They use different amounts of lees (the solids remaining after fermentation) depending on how long the spirit will be aged for - younger cognacs are distilled without lees to give a cleaner product, while more lees are used for cognacs destined to age for longer periods of time to give a more complex product. This particular cognac is a single cask distilled from 100% ugni-blanc grapes in 1995 and bottled in 2017 at 44% without coloring or chill filtration for Astor Wines. Much like the Dudognon, the bulk of the action here is in the aromas. If you're content to sit and sniff, this has quite a bit to offer. While a lot of the descriptors I gave are very sweet, I didn't find it cloying. 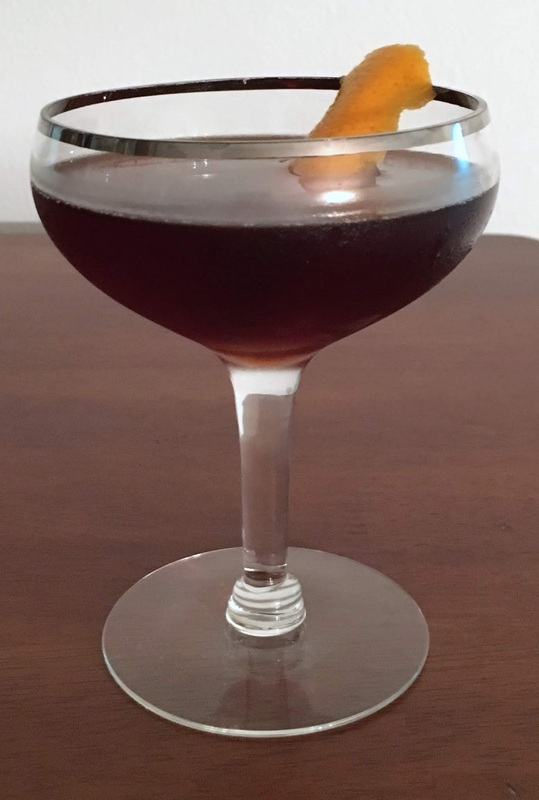 The flavors are good if simple and this could be a pleasant sipper to enjoy with a book, but you would miss most of the action that way. Also like the Dudognon, the lack of adjustments is clear. While this is a sweeter cognac, it's cleaner than the thicker sweetness you're likely to find in more mainstream releases. Overall, while I think it could offer a bit more complexity for the money, this was a solid cask pick by Astor. The Dudognon family have been growing grapes in the Grande Champagne region since 1776. While they sell some of their limited (~200 barrels per year) production to larger houses such as Hine and Remy Martin, they save some of the best to be labeled under their own name. The eau de vie is first distilled to 28%, then redistilled to ~70%. The new spirit is generally put in new oak barrels, then reracked into used casks for further maturation. Contrary to standard practice among cognac producers, their brandies have no additives. I have seen claims that this cognac has an average age anywhere from 20 to 25 years. It is bottled at 40% without coloring, but possibly with chill filtration. Nose: dry cognac grape-iness, vanilla extract, maple syrup, honey, grapefruit peel, floral/herbal undertones, sunflower seed oil. After adding a few drops of water the sweeter elements come to the fore and a bit of gentle oak is added to the mix. Taste: sweet grapes up front, apple/pear/grapefruit right behind, moderate tired oak from the middle back, berry overtones. After dilution it becomes noticeably sweeter up front, the oak becomes a bit brighter, there is a touch of tropical fruit in the background, and the berry notes are stronger. This is something of an odd duck for me. The quality is clearly there, especially in the aromas, but it took a while for me to find this cognac very engaging. It's a little too dry without further dilution to be an easygoing sipper, but the flavors and finish don't quite have the complexity to reward studied engagement. While it's not flabby at 40%, I do wonder what the spirit would be like at a higher strength. With all that said, I'm not sure if it really comes down to the spirit itself or my inability to tease apart its structure. I'm still relatively new to brandy as a category, so I'm not sure I have the experience to break it down in the way that I do with whisky. I will give them a nod for the lack of boise and other 'adjustments' that are so common in the industry. It doesn't have the syrupy quality I've found in many other cognacs and that alone is a pleasant surprise. I'd like to try more from this producer, though I think I'll want to try before I buy next time. Until recently most of the distilleries in Bacardi's portfolio flew below the radar, primarily going to blends with some casks escaping into the hands of independent bottlers. With the rising profile of single malts in general the management decided to raise their profile and released a series of single malts from each of their distilleries. 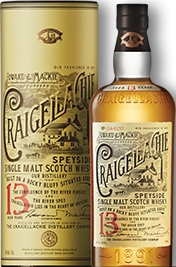 Most interesting among the bunch is Craigellachie, which has a number of features in common with fan-favorite Mortlach in the Diageo stable. This whisky was aged in refill American oak casks (both ex-bourbon and ex-sherry) then bottled at 46% without chill filtration but possibly with caramel color. I tasted this whisky from a purchased sample from WhiskySite. 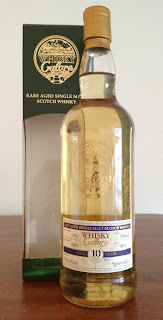 Nose: fairly immature green malt, dirty Craigellachie funk, a layer of cleaner sherry, vanilla. After adding a few drops of water it has more alcohol heat that covers up the other aromas, leaving it with little beyond cleaner malt and vanilla. Taste: sweet malt with a somewhat immature overlay throughout, sherry in the background, sliding into bitter but not tannic oak and some dirtier notes at the back. After dilution the immature character is pushed back, but doesn't entirely disappear, while the overall structure remains the same. In this day and age, this is a deeply strange OB single malt. I'm honestly not sure what audience this is targeting, because it's just so far outside the norm. With slightly more active casks I think this would be a winner for me because I like the dirtier elements of the malt. As is, I find it too raw in a way that covers up some of the potential complexity. Pot stills are the oldest form of distillation and continue to be used across the world, but one of their main limitations is that the maximum ABV that can be attained in a single distillation is ~45% from standard 8-10% ABV wash. The small amount of high proof spirit from the first distillation will also be highly contaminated with low boiling compounds that range from unpleasant to unsafe, so it has traditionally required at least two pot still distillations to produce flavorful, drinkable spirit. But double distillation is slow and expensive. Each run requires charging the still, consuming lots of fuel to heat it up, and cleaning out the remains in the pot after a run is complete. It also requires complex logistics to balance the flow of raw material through mashing, fermentation, and distillation so that equipment is being efficiently utilized. Distilling has always been a volume-driven business, so the more time it took to produce marketable spirit the less money a distiller was making on the vast amount of capital they had sunk into their plant, inputs, and labor. Somewhere in the 17th or 18th century distillers had the clever idea of hooking multiple pot stills together to perform multiple distillations simultaneously in series. These types of stills are now uncommon, but can still be found in a number of rum distilleries across the Caribbean such as the double retort systems at DDL in Guyana (both the Port Mourant wooden 'double' pot still and John Dore high ester still), Appleton, Hampden, and Worthy Park in Jamaica, and Foursquare and Mount Gay on Barbados. They can also be found in many bourbon distilleries coupled to column stills under the title of 'doubler' or 'thumper'. All perform a secondary or tertiary distillation to boost the ABV of the output without having to manually perform a second or third distillation. 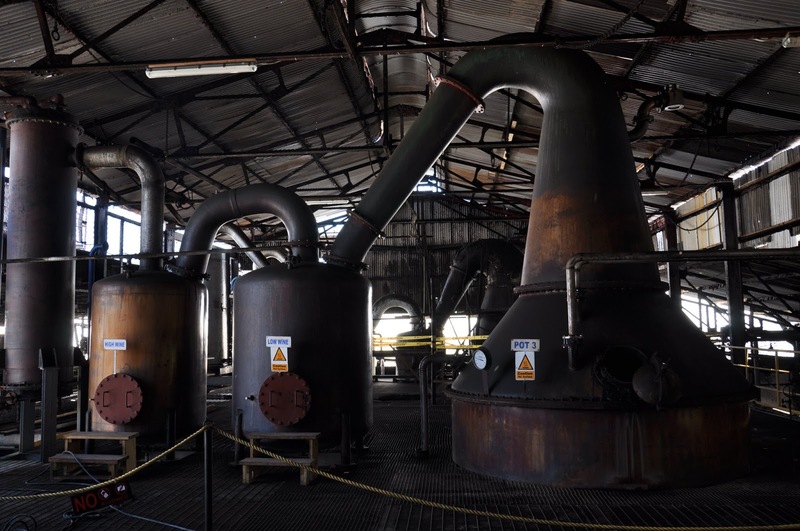 I've written before about the physics of pot stills and that background will be important for understanding what happens when they are connected to a retort. 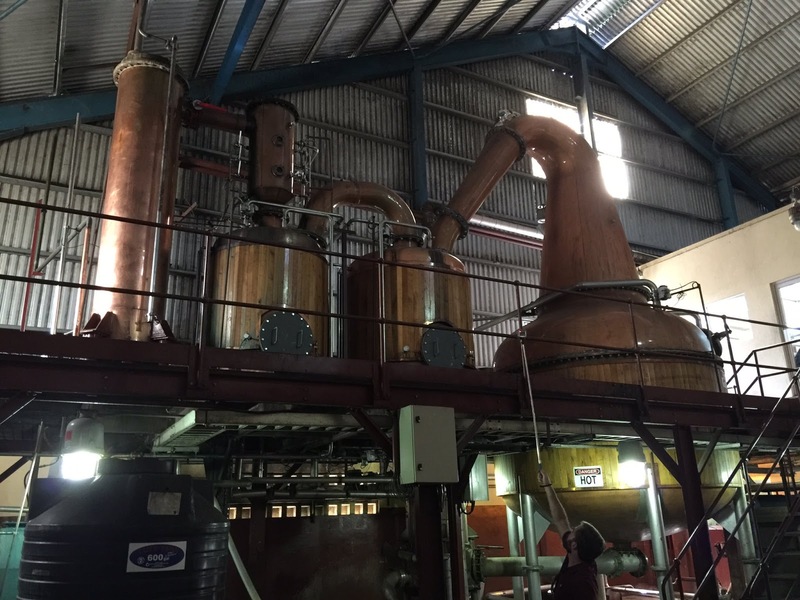 In essence all of this comes down to a bit of plumbing - while the lyne arm of a traditional pot still is connected directly with a condenser, a retort pot still passes the lyne arm into a additional pot still. This can either direct the hot vapor into liquid where it bubbles through and heats the contents through residual heat or the vapor can first be condensed then passed into the next pot where it is heated again and undergoes another distillation. In either case some portion of the liquid has to be passed back to the previous pot to maintain the liquid level as water and feints are left behind from the increasingly enriched vapor. Importantly, when this is a batch process being fed by a pot still all that is being changed is how many times the vapor is being redistilled. The distiller still makes heads, hearts, and tails cuts just like with a simple pot still. One of the most important parts of this process is what goes into the retort. If you put pure water in the retort the ABV of the output will not be significantly boosted, but some of the more water-soluble compounds may be scrubbed out, kind of like a hookah or bong. At many distilleries that use these systems, the retorts are loaded with what are called 'low wines' and 'high wines' (see labels on retorts in photo of Hampden Estate below), which are respectively the tails and heads from previous distillations diluted to differing degrees depending on the desired output. Others, such as DDL, combine the heads and tails together before loading them into the retort. This replicates the practice in many distilleries with simple pot stills of recycling feints back into the wash still for redistillation. A visual description of that process can be found here. For more flavorful spirits, stillage or dunder (what remains in the pot after a previous run) can also be charged into the retorts to boost the ester content in the Cousin's process (this is a sufficiently complex topic that it will get its own post at a later date). To cite one example of how a retort pot still operates, this report claims that Appleton's double retort pot still starts with 8% ABV wash that is converted into roughly 30% ABV output, which goes through the first retort charged with 30% ABV low wines and is converted into roughly 60% ABV output, which goes through the second retort charged with 75% ABV high wines to give a final product at 80-90% ABV. While the dynamics of retorts fed with the condensed output from the previous still (doublers in bourbon parlance) are basically the same as any other pot still, a vapor feed creates far more complex dynamics. What happens to the vapor bubbling through the liquid in the retort is dependent on a large number of influences that will shape the output. Thanks go out to user The Black Tot from the Rum Project forums, who did a pretty thorough job of thinking through what's happening in a retort. Vapor from the pot still emerges into the liquid in the retort, initially at a much higher temperature than the liquid. The height of the liquid in the retort creates pressure that compresses the bubble. These forces will make the bubble partially or completely collapse as the temperature drops and the pressure rises, driving the vapor within the bubble below its condensation point. The heat from the vapor, both from its initial temperature and the gas to liquid phase change, will be added to the liquid. That process will be more or less complete depending on the temperature of the liquid, the pressure in the liquid where the bubbles emerge, and the size of those bubbles. Low temperature liquid with a lot of depth and small bubbles will encourage complete collapse, while higher temperature liquid without much depth and larger bubbles will be more likely to reach the surface of the liquid and burst. The first case will give better separation as the liquid is gently heated, while the second case will give less separation as the liquid is quickly heated and boils turbulently, mixing up heavier and lower boiling components. The interplay between the size of the retort and the volume of the charge in it play an important role in determining how much heat will be lost from the system through radiant cooling and influence how much reflux is generated in the retort. A larger retort with a smaller charge will result in more cooling and more reflux, while a smaller retort with a larger charge will result in less cooling and less reflux. The charge will be influenced by how the stills are set up to handle the mass balance of the system - vapor enters the retort, gives up its heat, and the alcohol is preferentially vaporized again. The enriched vapor stream leaves water behind, which will tend to increase the amount of liquid in the retort. This is usually dealt with by passing some of the liquid back to the previous pot, but that can be plumbed in different ways. An outlet with a vapor lock part way up the wall of the retort can help to maintain a constant liquid level, while one leaving at the bottom will have a flow dependent on relative pressures in each vessel, though this can also be controlled with a valve if the distiller wants to vary the conditions over the course of a run. In some ways this is also analogous to a purifier pipe in the lyne arm of a pot still, passing material back to be redistilled and giving a greater amount of total reflux through the system. All of these parameters give a distiller multiple ways to control the process and output, resulting in full-bodied 'pot still' spirits in a single run that would take a standard pot still two to three distillations to match. In my next article in this series I will describe how this concept was transformed into the batch column stills that have become so common in the craft distilling industry. If Macallan is known for one thing it is its sherry cask matured spirit. While the "Oh crap, we can't keep up with demand" Fine Oak series blended bourbon casks (probably originally intended for blends) with a smaller proportion of sherry casks, the only way to get pure bourbon cask matured Macallan has been independent bottlers. This one is from one of Duncan Taylor's lines that was eventually dropped in favor of their NC^2 line. Both offered largely younger whisky at 46% without coloring or chill filtration at fairly reasonable prices. This whisky was distilled in 1992, filled into (probably Nth refill) ex-bourbon casks, then bottled in 2003 at 46% without coloring or chill filtration. Nose: so much ethyl acetate, clean malt, a little green/grassy, unripe apples/pears/peaches, some vanilla in the background, very little oak, orange peel. After adding a few drops of water the ethyl acetate settles down a bit and it gets maltier, the vanilla is amplified but the fruit notes fade a bit into the background. Taste: malt sweetness with an undercurrent of ethyl acetate throughout, a pleasant thickness around the middle, and a bit of savory oak/malt going into the finish. After dilution it becomes much sweeter, the fruitiness around the middle is amplified, and the savory notes at the back are joined by some orange peel, but there's also more grassy bitterness in the middle. This was a somewhat disappointing whisky. While there's clearly some good, fruity spirit in there, it's the strong ethyl acetate notes throughout make it hard to enjoy what it has to offer. With slightly more active cask with more porous wood I can envision this being much better, but as is I feel like it would need many more years of evaporation to settle into something good. It also seems rather similar to the Whisky Galore Glenlossie I tried a while back, which also had some prominent ethyl acetate notes. I'm more than a little surprised that these casks were chosen for bottling, even with such a famous name attached, but I've questioned the bottling decisions made at Duncan Taylor during the 2000s and this seems of a piece with them. 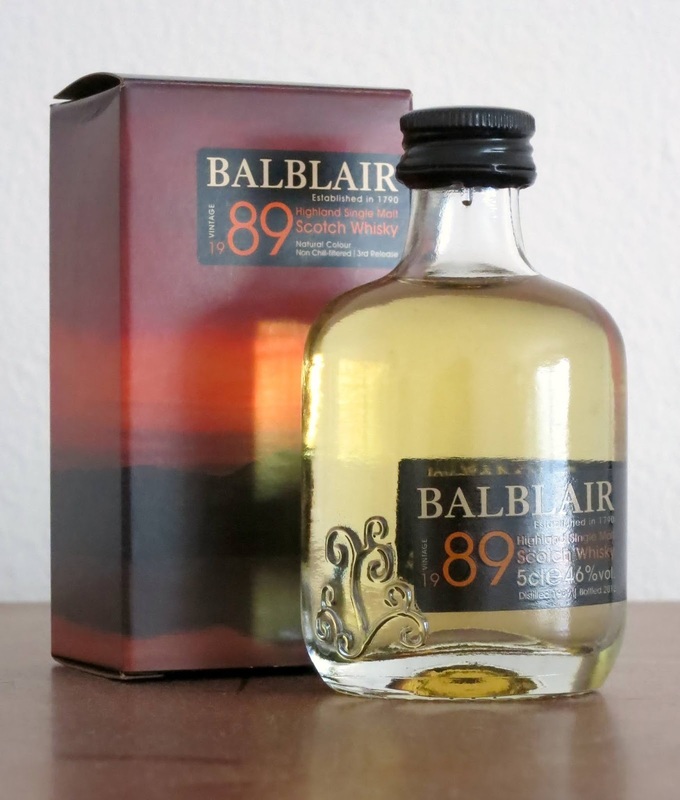 The 1978 vintage is one of the few from Balblair that has only received a single release. It was eventually replaced in 2012 by a second release from the 1975 vintage. This at least suggests that Balblair really is going through their warehouses to find the casks that they think work best rather than simply marching forward through whatever they happen to have on hand. 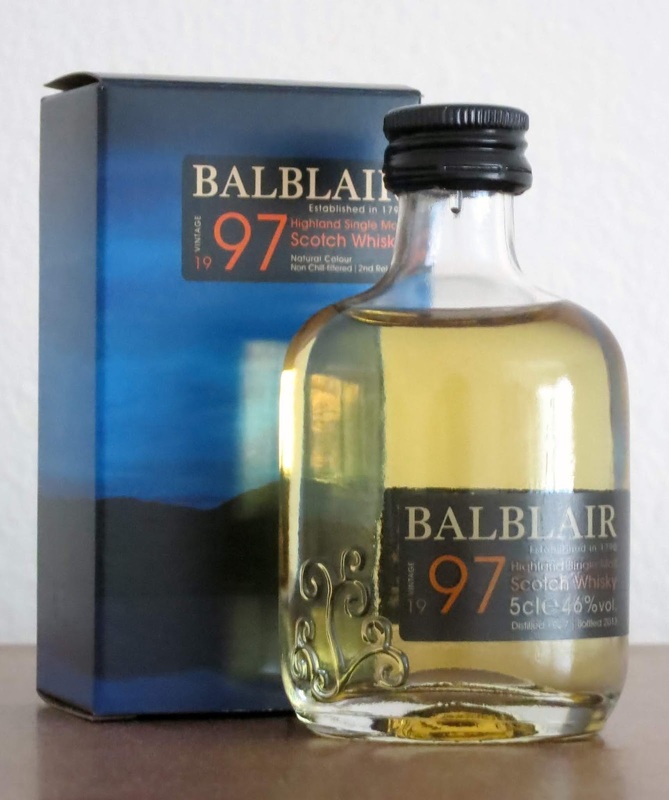 Nose: fairly typical Balblair, but more refined and a little tired until it sits in the glass for a good while - clean honied malt, orange peel, strongly herbal, vanilla, light oak, a little tropical fruit and berry/grape/sherry. After adding a few drops of water it becomes softer and more malty with a slightly savory edge, but the structure remains largely the same. Taste: fairly light - honied sweet malt up front, becoming herbal with vanilla and grape-y fruit around the middle, plus an undercurrent of gentle oak throughout that grows stronger around the back. After dilution it gets sweeter up front and feels more green/herbal around the middle, but stays largely the same. This feels like a logical extension of the 1989, but with more complexity in the aromas and finish. While it is also composed from refill ex-bourbon casks, the impact is dialed up just enough to keep it from feeling too spirit-y. I was a little disappointed by the flavors in comparison, but the way it was bracketed by the aromas and finish makes up for a lot of that. Overall it's very solid spirit aged in not overly-aggressive casks, which is the kind of thing that is getting increasingly difficult to find without spending an arm and a leg. 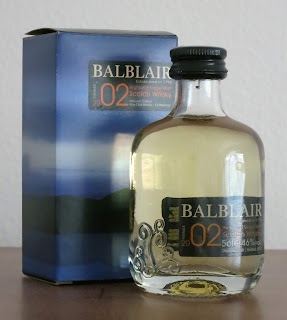 Balblair has done a number of releases from this vintage, beginning in 2007 and ending in 2012, signaling the end of their (almost?) exclusively ex-bourbon lineup and shifting into a lineup that featured blends of ex-bourbon and ex-sherry casks. This release was distilled in 1989, filled into refill ex-bourbon casks, then bottled in 2012 without coloring or chill filtration. I bought this sample as part of a set at The Good Spirits Co in Glasgow in 2013. Nose: kind of Balvenie-ish - honied malt, rich vanilla, orange peel, pineapple, beeswax, a little floral. After adding a few drops of water the wax and floral notes expand, the malt becomes drier, and some grape notes come out. Taste: opens with sweet malt and floral honey undertones, which carry all the way through, some vanilla and vague fruit/berries around the middle, and a light oak overlay near the back. After dilution it retains more or less the same structure but in a softer mode and with some greener notes at the back plus a little pleasant mustiness. While not particularly complex, this is a good, solid bourbon cask whisky. I appreciate that Balblair was willing to showcase their spirit without the crutch of sherry casks for so long and wish that they were still doing it, because I think it offered something similar to older bourbon cask Balvenie and Clynelish that can be rather difficult to find these days. I would probably buy a bottle if I could find it for under $120, but that seems pretty unlikely at this point. Definitely not at the local price of $500 a bottle. Balblair's vintage release strategy offers a rare chance to experience spirit distilled during the same year at different ages. This was the second release of the 1997 vintage, with another five years in the casks compared to the first release. This miniature was part of a set I purchased at the Good Spirits Co in Glasgow in 2013. Nose: pretty standard ex-bourbon barrel whisky - good balance of caramel, oak, vanilla, milk chocolate, and malt, greener young Balblair notes are becoming herbal, berries, orange peel, and vague fruitiness in the background. After adding a few drops of water the balance shifts towards the spirit and away from the cask - more green malt, less caramel and oak, plus a little bit of pineapple, pear, and mocha. Taste: sweet caramel and roasted malt up front, vanilla in the middle, joined by well-integrated oak and some light green notes going into the finish. After dilution it feels more youthful, with more green malt and less oak/caramel, plus extra vague fruit around the middle. This is one of those rare whiskies where the finish is the best part of the experience. The aromas and flavors are totally decent but somewhat unremarkable in comparison to the confectionary experience after the swallow. Much of that is lost with the addition of water, so I'd hold off unless you have a whole bottle and want to experiment. There is a clear evolution from the younger 1997 vintage that I tried a while ago, with a switch from a more spirit-driven release to a more cask-driven release. In many ways this takes some of the best parts of bourbon and repackages them in a malt whisky context, amplifying the good parts (caramel, vanilla, chocolate/coffee) and smoothing out the rougher edges (overly aggressive oak) into a very tight package. It's not particularly complex, but what it does well it does very well. I wish I could have picked up a whole bottle when it was available, but such is the way of the whisky world. For the last decade or so Balblair has been releasing younger (10-12 years old) vintage single malts. I tried a couple of them (1997 and 2001) a while back and found that their character varied quite significantly despite their nominally similar composition. This whisky is part of the same lineup and was released in 2012 from what Balblair claims were first-fill ex-bourbon casks bottled at 46% without coloring or chill filtration. This miniature is from a set I purchased at the Good Spirits Co in Glasgow in 2013. Nose: fairly typical of younger Balblair - fresh/green malt dominates, vague fruitiness (pineapple/mango/grapefruit? ), very little cask impact, a little creamy vanilla. After adding a few drops of water the green/new make notes become much stronger and more unpleasant. Taste: sweet malt beginning up front, joined by green youthfulness all the way through, some vague fruitiness (tropical/berries) starting around the middle, more malt with a sour edge going into the finish. After dilution it becomes sweeter and the mouthfeel is thicker, but the green notes become stronger in the middle. If you've had younger Balblair before then you probably know about what you're in for here. As with many of them if feels like this is composed entirely of whisky from second- or third-fill casks that have barely been able to round off the rougher edges of the new make spirit. The choice to bottle at 46% appears to have been necessity more than just style, since the aromas absolutely fall apart with even a little bit of water. Compared to the 2001 this was more straightforward, but also more boring. Overall, it was fine but not something that I would search out. Glen Garioch is one of the oldest still active distilleries in Scotland, but it has gone through a number of rough patches over the centuries when it was closed or mothballed. This happened most recently between 1995 and 1997, when the floor maltings were eliminated and the distillery switched to using unpeated commercial malt. This whisky was distilled in 1997, filled into first- and second-fill ex-bourbon casks, then bottled in 2012 at 56.7% without coloring or chill filtration. Nose: the high proof is very clear from the initial strong alcohol heat, which eventually clears to reveal fresh malt, some vague fruit notes (melon? berries? ), pleasant vanilla, pencil shavings, light dusty oak, soy sauce, and a slightly industrial savory note that reminds me a bit of Ben Nevis. After adding a few drops of water the industrial/savory notes become creamier and integrate with the vanilla, the malt becomes toasted grain, the oak turns into cinnamon and cedar, and some green/pine notes poke out around the edges. Taste: lots of alcohol heat up front, sweet, very creamy malt throughout, light oak near the back. After dilution the alcohol heat diminishes significantly and some vague fruitiness comes out around the middle, but the overall structure remains the same. Finish: clean malt, industrial lubricants, savory, mild oak, vague fruitiness (berries, raisins). After dilution the character of the finish largely fades and becomes hot, vague, and bitter. At full strength this is a slightly odd whisky. While I can see why it's been described as 'modern' Glen Garioch, it's also pretty clearly spirit-driven with very minimal amounts of oak influence. The industrial/savory notes are probably the most appealing part, giving more character to what would otherwise be a fairly bog standard Highland whisky. Though I found the initial heat somewhat off-putting, it settled down nicely in a way that makes me think a whole bottle would be rather drinkable. My biggest disappointment was how the finish just disappeared after adding even a little way, removing one of the best parts of the experience. It would be interesting to experiment and see if there's a degree of dilution that retains the finish, if you don't have much to work with I'd leave it be. I can also see why people bemoan the loss of the older floor malt Glen Garioch as a bit of peat could really take this spirit to the next level. While I'm glad to have tried a pure bourbon cask release first, I can also see how this would take well to sherry casks, hopefully edging further in the savory direction. Bowmore 17 Year preceded the now standard 18 Year, then was relegated to the travel retail section. While the 18 Year has a preponderance of sherry casks over bourbon casks, the 17 Year inverts the percentages and has a higher proportion of bourbon casks than sherry casks. This whisky was bottled at 43% with coloring and chill filtration. I purchased this sample as part of a gift set at the Bowmore distillery in 2013. Nose: fairly subtle - balanced sherry, malt, mossy peat, and American oak, a little savory and salty, coffee. After adding a few drops of water the oak and peat are slightly amplified, making it richer but simpler. Taste: bourbon-y caramel up front, subtle peat and oak from the middle back, a touch of sherry with some more European oak going into the finish. After dilution the oak and peat are amplified, while the sherry spreads out underneath the other flavors alongside some floral notes. While this has gotten a little tepid at full strength, it has the basic structure of the 17 Year that I tried during the distillery tasting and enjoyed quite a bit. Whether your prefer the 17 or 18 Year is mostly dependent on how much sherry you want in your Bowmore. I prefer the bourbon cask end of the spectrum, so this works for me, especially as I find the oak to be less aggressive. Sadly it is also long gone, so I'll have to make due with the cask strength 17 year old Bowmores I have waiting for me. Bowmore Mariner was another whisky that was aimed at the travel retail market during the 2000s and (I think) was discontinued around 2013. This whisky was aged in a combination of ex-bourbon and ex-sherry casks, then bottled in 2009 at 43% with coloring and chill filtration. I purchased this miniature as part of a set at the Bowmore distillery in 2013. Nose: classic Bowmore notes - balanced fresh malt and light herbal peat, red wine and berries in the background, seashore, a bit savory with a touch of something floral. After adding a few drops of water the wine notes mostly fade, leaving a soft bed of malt with more peat and a touch of ex-bourbon oak and caramel. Taste: sweet wine opening, clear red wine and raspberry right behind, fading out through mild oak and a little bit of herbal peat, all on top of a base of clean malt with light violet/lavender top notes. After dilution it becomes more integrated, with less peat and a slight waxing and waning of the wine notes across the palate. While the construction of this whisky and the Enigma are nominally very similar, the results are very different. The wine notes are far more present right off the bat, but they end up reading more like a red wine than a fortified wine finish to me. If it had hit like I expect a sherry finish to, sort of a more subtle Darkest, I could see myself drinking a lot more of this. It's nuanced but not flat, with excellent balance. I wouldn't pay over the odds for this, but if you like peat and wine finishes, this would be a good one to grab if you happen to stumble upon a bottle (WhiskyBase currently has a few at not wildly inflated prices if you're so inclined). Bowmore Enigma was part of their travel retail lineup from the early-2010s. It was constructed similarly to the standard 12 Year, but with a higher proportion of sherry casks in the mix, much like the standard 18 Year. This whisky was aged in a combination of ex-bourbon and ex-sherry casks, then bottled in 2009 at 40% with coloring and chill filtration. Nose: classic Bowmore mossy/ashy peat with a healthy dose of wood smoke, leather, cured meat, sweet sherry underneath, clean/fresh malt, vanilla, some jammy fruit. After adding a few drops of water the malt, peat, and barrel char become more clear, a little floral perfume emerges, while the oak and sherry retreat/turn into maple syrup. Taste: opens with sweet malt and a layer of sherry, quickly overlaid with oak tannins, barrel char, and a rising wave of mossy peat smoke that crests and resolves into more oak tannins and some fruity malt going into the finish, plus a light citrus note riding over everything. After dilution the oak backs off a bit to reveal more sherry but less peat and it is generally more mellow throughout. This is a solid Bowmore, especially considering that it's not at its best at their bottling strength and with their usual manipulations. I'd need to try them side by side, but this seems pretty close to the standard Bowmore 12 Year, albeit with a little bit more going on. The aromas and the tropical fruit notes in the finish are probably the best pieces, while the flavors are OK but unspectacular. Water helps in the sense that the oak is less assertive, but both the aromas and flavors become more simple. If you happen to stumble upon a liter bottle for, say, $50 or less it wouldn't be a bad deal if you already enjoy the 12 Year, but it's not something that I would go out of my way for. If you go looking for older armagnac in the States, odds are that you will end up finding something from Delord. They're one of the few nearly ubiquitous armagnacs in the U.S. and offer a large number of age-dated and vintage releases at seemingly attractive price points. Delord was founded by one of the mobile distillers of the region in 1893. His sons turned it into a permanent operation in 1932 with an estate in the Bas Armagnac region. They distill from a mixture of ugni blanc, colombard, baco, and folle-blanche grapes that are vinified separately and then distilled using both continuous and batch stills. The continuous still distillate is primarily used for spirits destined to age for a significant amount of time while the double distilled spirit is primarily used for younger expressions. Nose: balanced between raisin and sharp oak, some creamy vanilla, herbal, musty chalk/cardboard, floral pink bubblegum, and caramel. After adding a few drops of water the oak becomes a bit softer and lets the raisins shine more, but the overall structure is largely unchanged. Taste: bittersweet throughout, grape notes underneath up front, slowly transitioning into almost pure syrup-y oak tannins with a little bit of caramel at the back. After dilution the bitterness retreats significantly and the grape notes are more clear up front, but the overall structure is largely unchanged. I am not a fan of this armagnac. While it is an excellent value on its face - a quarter century old from an old house - it feels like too much has been done to the spirit to make up for inadequate or over-active casks. Like too many spirits these days, it feels engineered for a price point rather than to display what Delord is capable of. Alternatively, it could be created to capture drinkers who believe that older spirits are inherently oak-driven. I'm very thankful to have seen just enough skeptical reviews to keep myself from buying a whole bottle, as it was very tempting when I saw it available locally. With all that said, if you're a bigger fan of bourbon this might click for you. The overall flavor structure is somewhat similar, albeit with grapes instead of grain, and the density of the aromas is very strong for the strength of the spirit. Just maybe try to find it at a bar before you spring for an entire bottle. For two slightly different takes on samples from the same bottle, check out MAO and SKU. I've been out of habit of marking the anniversary of this blog's creation, but it seems like a good time for another retrospective. Things have been quieter over the last few years, not necessarily because I don't have anything to write about, but because I just haven't been drinking as much. Sometime after I finished my PhD in 2016 I more or less stopped entirely. Given that it was something of a rough time mental health-wise, that was probably for the best considering the alternatives, but it's taken quite a while to get back up to speed. Lately that's been making me ask why I still write this. I'm not getting paid. The heyday of cocktail blogs that I was in the thick of when I started has mostly faded as people either turned pro or simply found that there was too much competition for their time. While I found a second wind in the rise of whisky blogging, even that seems to be losing steam for many of the same reasons. What it really comes down to is that I feel like I have gotten a lot out of reading other folk's blogs and I still want to contribute. While not perfect, independent voices are still deeply needed right now. Sure, that gives me mixed feelings when I review spirits that haven't been available for years or are now wildly expensive when they can be found, but there is still value in chronicling where we were to understand where we are now. Part of this is also wanting to get back to writing about the science of spirits. If you follow me on Twitter you can probably guess what my next post will be about. It's one of the ways that I feel like I can really add to the community by translating complex concepts into something more understandable. So there will definitely be more of that in future. You can also expect to see more non-whisky posts. I have managed to whittle down my open bottles of malt whisky to three right now and I'm hoping to get it down to zero just for a change of pace. There should be more cognac, armagnac, rhum agricole, and other spirits on the horizon as I try to expand my palate. With that said, I also ordered a giant pile of whisky samples recently, so there should still be plenty of those sprinkled throughout as well. Overall my goal is to keep from feeling like I'm in a rut. Grinding out whisky reviews has been useful in a lot of ways, but I was starting to feel like I was drinking too many for academic purposes instead of because they were enjoyable in and of themselves. Here's to enjoying what we drink. explore the city before and after. Unsurprisingly, one of my first plans after checking into my hotel and getting some food in my stomach was finding somewhere for a drink. After a slightly confusing walk through the Gothic Quarter to find that the places I had been looking for were closed, I stumbled upon Dux while trying to get back to a main street. While very quiet on a Tuesday night, it looked inviting. 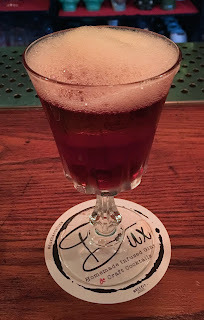 Dux is set up in the now-classic craft cocktail bar mold, with a vague speakeasy style. The decor harkens back to the early-20th century and there is live jazz on more happening evenings. 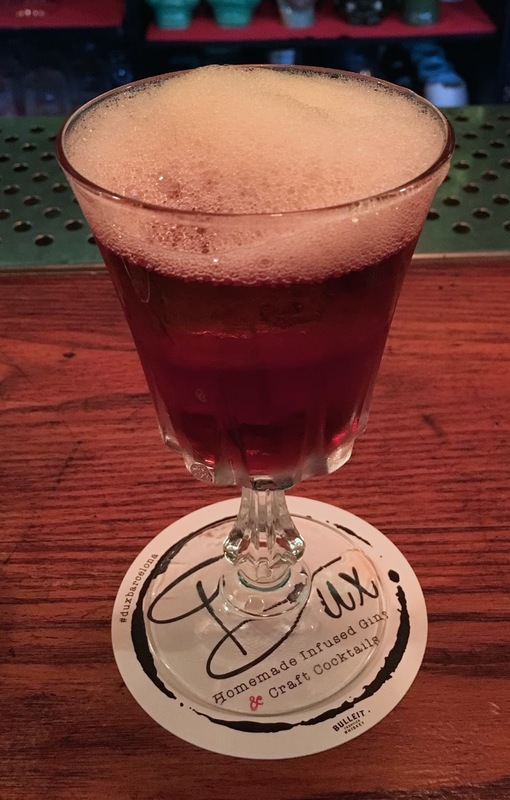 While the bartenders have more of a Portland hipster vibe in checked shirts and aprons instead of the previously regulation arm garters and handlebar mustaches, they know their trade and make extremely good drinks, many from an array of infused gins. In keeping with the craft cocktail vibe, many of the signature drinks from their menu have a somewhat over-the top presentation (I saw at least one being served in a tiny bathtub), but their construction is always impeccable. Despite the crowded weekend night conditions, I got an absolutely stellar Last Word that was perfectly balanced between bitter, sour, and sweet. Overall, I would highly recommend dropping by if you're in Barcelona and looking for a fancy but not overly pretentious drink. They will treat you well, whether it's a quiet Tuesday or a slammed Saturday. 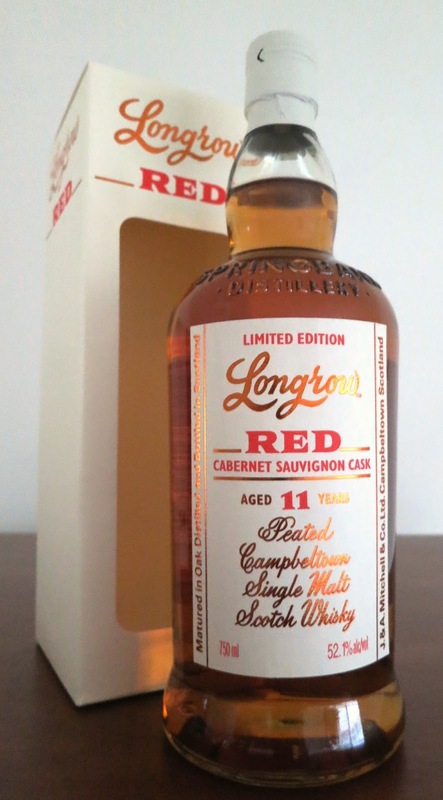 Continuing the Longrow Red series, this was released in 2015 and returned to the red wine finishes after the atypical port cask release of 2014. This whisky was aged in bourbon barrels for 11 years then finished in fresh Pinot Noir casks for an additional year, then bottled at 52.9% without coloring or chill filtration in an outturn of 9000 bottles. Nose: balanced savory peat smoke and wine, floral, bubblegum, vanilla, banana? After adding a few drops of water it becomes more savory with a hint of cured meat, the peat and wine are softer and more integrated, and the malt is creamier. Taste: wine and malt sweetness up front, gentle oak and off-dry wine in the middle, a little heat and a bump of dry malt with background peat smoke before the finish, plus more wine at the back. After dilution it becomes softer and sweeter up front, the wine is more integrated, and the peat folds into the stronger oak at the back with creamy malt undertones. The wine in this release reads more like a fortified wine than a red wine. While some of it may be because the bottle has been open for quite a while, it comes off as simpler and far softer than the Cabernet Sauvignon with some compensation in stronger and more savory peat at full strength. Overall I liked this, especially as I think I would have gone through the bottle more easily than the Cab. With that said I don't think I'd be willing to pay the $110+ that the remaining bottles in the States appear to be going for. Longrow Red is a series of heavily peated, full strength, wine cask finished whiskies that has been coming out since 2012. While most have been red wines, there have been exceptions such as a port cask finish. Importantly, unlike many finished whiskies, these are closer to double maturations in that the finishing periods range from 1-5 years. This whisky was aged in refill ex-bourbon hogsheads for 7 years, transferred to fresh Cabernet Sauvignon hogsheads for 4 years, then blended to give an outturn of 9000 bottles at 52.1% ABV without coloring or chill filtration. Nose: gobs of fresh malt, slightly sour wine, dry peat smoke, fresh vegetation, dried lavender, cinnamon bark, mild oak, savory/yeast undertones. After adding a few drops of water it becomes softer with more savory malt, the wine fades significantly behind dry oak and peat, and the lavender remains a solid thread behind everything. Taste: fairly hot up front with sour & sour wine on top, creamy malt underneath, fade out through oak/wine tannins and dry peat, gently floral at the back. After dilution the heat fades significantly, but the structure remains overall the same except for a bump of extra sourness at the back. While a little on the hot side, this is a very solid whisky. I wish the wine influence was more integrated, but the finishing period seems to have been long enough to keep it from feeling like something slapped on top of the spirit. The nose is by far the best part, with a good balance between intensity and complexity, especially after it's had some time to breathe in the glass. In contrast the flavors are a little less exciting, without any particular complexity. While there's nothing wrong with this strength, it's a sort of unsatisfying middle. It doesn't have the intensity of full strength, but also doesn't have the extra peat that emerges with even more dilution. Additionally, the sourness in the aromas somehow seems even more assertive than at full strength, which makes it less pleasant than it would otherwise be. With that said, the hard apple cider character that emerged after the whisky had been in the glass for a while was really interesting. While dilution takes away most of the heat, it doesn't diminish the intensity of this whisky. It was a pleasant surprise to find out how much stronger the peat is at this strength, even if it loses a little bit of complexity. I think I prefer it at full strength, but it would be quite welcome at 46% when I'm looking for something more easy-going.